Saint Finnian was an early Irish monastic saint. He is considered one of the fathers of Irish Monasticism and is sometimes called a “teacher of the Irish Saints.” He was born in the late fifth century. He founded a monastic community and traveled on to Clonard where he built himself a cell and a little church where he settled in to study, pray and practice mortification. The fame of his sanctity soon spread and scholars from all over began to flock to him. He then built a monastery and began to teach. His rule was known for its strictness and asceticism. No fewer than three thousand pupils were studying at one time under Saint Finnian. His gift for teaching inspired many great men who then helped spread the faith far and wide. Saint Ciaran of Clonmacnoise and Saint Columba of Iona are among the many who studied under him. Saint Finnian died of the plague in 549. His sister, Regnach, is also a Saint. His feast day is December 12. 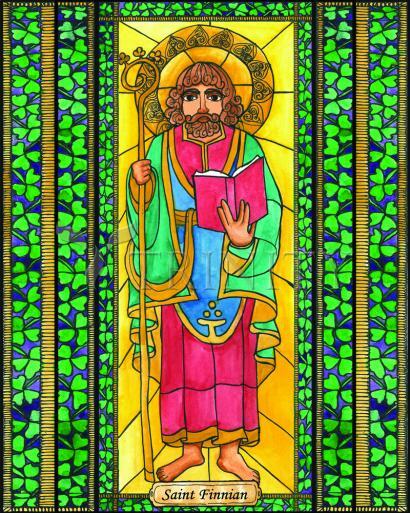 Among the primitive teachers of the Irish church the name of Saint Finnian is one of the most famous, after that of Saint Patrick. He was a native of Leinster and was instructed in the elements of Christian virtue by the disciples of Saint Patrick. Having an ardent desire to make greater progress, he went over into Wales, where he met and conversed with Saint David, Saint Gildas and Saint Cathmael, three eminent British Saints. After remaining thirty years in Britain, he returned to Ireland in about the year 520, excellently qualified by his sanctity and sacred learning to restore the spirit of religion among his countrymen. Like a loud trumpet sounding from heaven, he roused the insensibility and inactivity of the lukewarm, and softened the most hardened hearts, long immersed in worldly business and pleasures. To propagate the work of God, Saint Finnian established several monasteries and schools, chief among which was the monastery of Clonard, which he built and which was his ordinary residence. From this school came several of the principal Saints and Doctors of Ireland: Kiaran the Younger, Columkille, Columba son of Crimthain, the two Brendans, Laserian, Canicus or Kenny, Ruadan, and others. The great monastery of Clonard was a famous seminary of sacred learning. Saint Finnian was chosen and consecrated Bishop of Clonard. Out of love for his flock and by his zeal for their salvation, he became infirm with the infirm and wept with those that wept. He healed souls as well as the physical infirmities of those who came to him for assistance. His food was bread and herbs, his drink, water, and his bed, the ground, with a stone for his pillow. He departed to Our Lord on the 12th of December in 552.